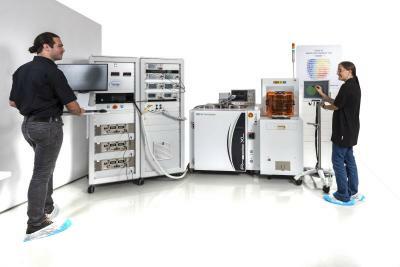 MRAM-Info is a news hub and knowledge center born out of keen interest in MRAM memory technologies. MRAM is a next-generation memory technology, based on electron spin rather then its charge. Often referred to as the "holy-grail of memory", MRAM is fast, high-density and non-volatile and can replace all kinds of memories used today in a single chip. Hprobe, a developer of testing equipment for magnetic devices, announced that it has teamed up with the IMEC research institute to jointly extend Hprobe's fast testing protocols for SOT-MRAM devices. Hprobe has already begun to optimize its test flow for SOT-MRAM devices in order to bring the characterization and testing to an industrial level with the primary objective to reduce the testing time while maximizing yield. 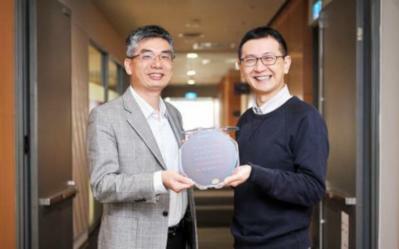 Researchers from Taiwan's National Tsing Hua University (NTHU)managed to use a spin current to manipulate the exchange bias in Spin-Orbit Torque memory (SOT-MRAM). The researchers say that this has been a long-time challenge in the field. To achieve this, the researchers added a platinum layer under the ferromagnetic and antiferromagnetic layers of the MRAM device. The researchers patented this technique before publishing their findings. Everspin announced its financial results for Q4 2018. Revenues in the quarter grew 21% from last year to reach $12.3 million, while total year revenues in 2018 grew 38% from 2017 to reach $49.4 million. Net loss in the quarter was $3.5 million (down from $4.4 million in Q4 2017). Net loss for the whole 2018 was $17.8 million (down from $21.1 million in 2017). 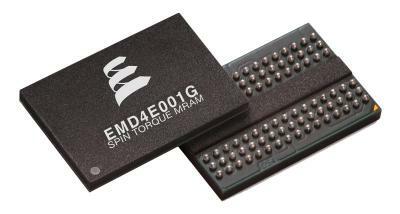 Everspin says that it has increased the production volume of its 40nm 256Mb STT-MRAM in support of its lead flash array customer. Everspin ended 2018 with with cash and cash equivalents of $23.4 million. In October 2018 Intel revealed that it is developing embedded MRAM - and that the company has successfully integrated embedded MRAM into its 22nm FinFET CMOS technology on full 300mm wafers. Now Intel gave more details on its embedded STT-MRAM, and said that the technology is ready for high-volume manufacturing. 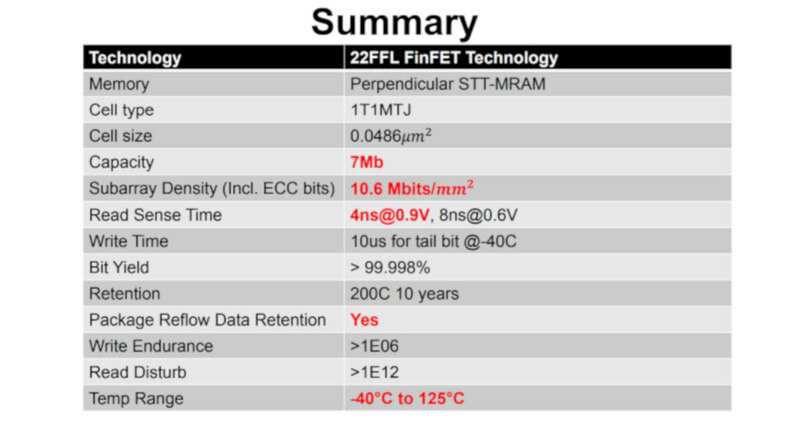 Intel said it has used a "write-verify-write" scheme and a two-stage current sensing technique to create 7Mb perpendicular STT-MRAM arrays in its 22FFL FinFET process. Everspin Technologies announced that it started to ship pre-production customer samples of its 28 nm 1Gb STT-MRAM chips in December 2018. Everspin already announced that it started to sample these new 1Gb STT-MRAM chips in November 2018. In November 2017 Everspin announced it will delay its 1Gb STT-MRAM chips as its focus has shifted to its 256 Mb STT-MRAM chips. It is great, tough, to see Everspin progressing with its larger MRAM chip and we hope that mass production will begin, as planned, in the middle of 2019. 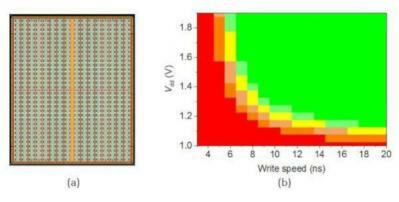 Researchers from Japan's Tohoku University developed a 128 Mb STT-MRAM device that features a write speed of 14 nm, the world's fastest STT-MRAM chip at a density over 100 Mb. To achieve this high speed, the researchers developed MTJs that are integrated with CMOS, which also significantly reduces the power-consumption of the memory device.